Posted in Mainstream Polish, Manicures, Nail Art, pictures	by Jessica W.
So this is my current mani – I wasn’t feeling my last mani any more and I’m struggling with anxiety (hello again, my old friend); deciding last night to sit down and do my nails helped a bit. Even though my lines aren’t straight (why did I think freehanding lines would be a good idea when I’m having anxiety?? ), I think it came out pretty professional looking for polishes that cost me $1. Actually the Color Last polish cost me $2 – big spender over here. I bought I think about 20 (? maybe 30?) L.A. Colors polishes last weekend because I couldn’t find any new Sinful Colors. Then I gave up buying new polishes & makeup for Lent and of course everyone and their dog is having amazing polishes come out. I kind of went on a tangent there. Stream of consciousness writing? I guess I kind of tend to prattle on when I’m having anxiety. Anywho, I like how the mani came out and I hope you like it too. If you struggle with anxiety, let me know how you cope – I’d love to get some new tips. Those LA Colors Color Craze are great little polishes. Love their price point and their range of colors! 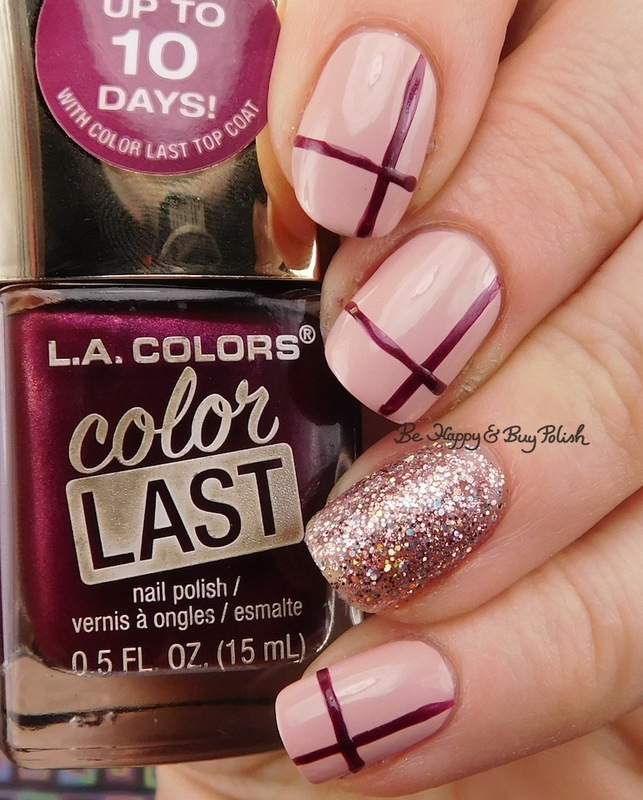 Nice mani – I can’t do a freehand line to save my life! I think it came out really pretty. Sorry you were dealing with anxiety. I know all too well what that’s like, and I’m happy we have an outlet that can distract us. Ever since I quit that horrible job that made my life miserable, I have felt so much better. I’ve been at my current job for almost 4 years now and it makes me feel like a big part of my anxiety and depression centered around bad work situations.